Economic cybernetics [Text]: int. sci. journal / Donetsk national university; [head of ed.board Yu.G.Lysenko]. - Donetsk: DonNU, 2013. - №4-6(82-84) - 95 p.
Economic cybernetics [Text]: int. sci. journal / Donetsk national university; [head of ed.board Yu.G.Lysenko]. - Donetsk: DonNU, 2013. - №1-3(79-81) - 100 p.
Economic cybernetics [Text]: int. sci. 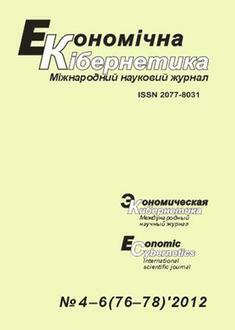 journal / Donetsk national university; [head of ed.board Yu.G.Lysenko]. - Donetsk: DonNU, 2012. - №4-6(76-78) - 93 p.